Solar flares like the huge one that erupted on the sun early today (Aug. 9) will only become more common as our sun nears its maximum level of activity in 2013, scientists say. 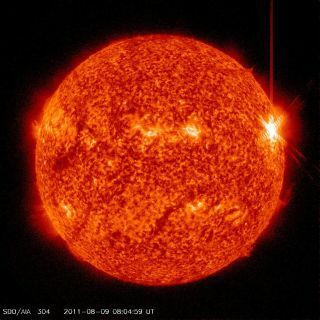 Tuesday's flare was the most powerful sun storm since 2006, and was rated an X6.9 on the three-class scale for solar storms (X-Class is strongest, with M-Class in the middle and C-Class being the weakest). Flares such as this one could become the norm soon, though, as our sun's 11-year cycle of magnetic activity ramps up, scientists explained. The sun is just coming out of a lull, and scientists expect the next peak of activity in 2013. The current cycle, called Solar Cycle 24, began in 2008. Earth got lucky with the most recent flare, which wasn't pointed directly at Earth; therefore, it didn't send the brunt of its charged particles toward us, but out into space. However, we may not be so fortunate in the future, experts warned. Spacecraft such as the Solar Dynamics Observatory (SDO), which recorded amazing videos of the Aug. 9 solar flare, and other observatories will be vital in monitoring the sun during its active phase, researchers said. Storms brew on the sun when pent-up energy from tangled magnetic field lines is released in the form of light, heat and charged particles. This can create a brightening on the sun called a flare, and is also often accompanied by the release of a cloud of plasma called a coronal mass ejection (CME). These ejections are the part we Earthlings have to worry about. As the CME careens through space, it can send a horde of charged particles toward our planet that can damage satellites, endanger astronauts in orbit, and interfere with power systems, communications and other infrastructure on the ground. "We're well aware of the difficulties and challenges," Kunches told SPACE.com. "We know more about the sun than we ever have." Can we predict solar storms? When a big storm occurs, the Space Weather Prediction Center releases a warning to the U.S. Department of Homeland Security, emergency managers and agencies responsible for protecting power grids. Then power grids can distribute power and reduce their loads to protect themselves. Satellite and power companies are also trying to design technology that can better withstand the higher radiation loads unleashed by solar storms. Still, scientists would like to offer more advanced warnings when big storms are headed our way. "We're being reactive, we're not being proactive," Chamberlin said. "We don't know how to predict these things, which would be nice." Chamberlin said solar science has come a long way in recent years, though, and the goal of SDO and other NASA projects is to improve our understanding of the sun and our ability to forecast space weather.